A Week In Celebration and Honor of Transgender Folks! November 13th - November 20th! 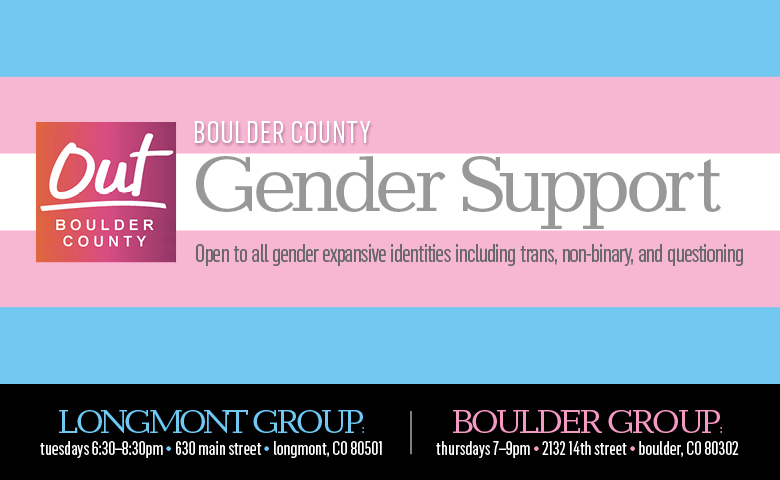 Out Boulder County celebrates Transgender Awareness Week, an annual celebration of the trans community meant to raise awareness, educate allies, and commemorate those in the community that currently face or have lost their lives to anti-transgender violence. The week culminates in a Transgender Day of Remembrance Service. Transgender Day of Remembrance (TDOR) is an annual observance on November 20 that honors the memory of those whose lives were lost in acts of anti-transgender violence. We make sure there is something fun, educational, and supportive for all ages. Thank you so much to Bank of America and Whole Family Dentistry for helping make this year’s Trans Awareness Week a possibility. Join us for an evening of story-telling in which you will hear inspiring stories, learn about trans experiences, have an opportunity to have your questions answered, and learn how to be a better ally. Weekly peer-support meeting open to all gender expansive identities including trans, non-binary, and questioning. 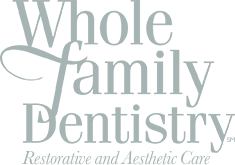 Additional meeting at OBC Longmont office every Tuesday, 6:30-8:30pm. Drop in and stay as long as you can! Celebrate Trans Awareness Week with OBC's youth program! 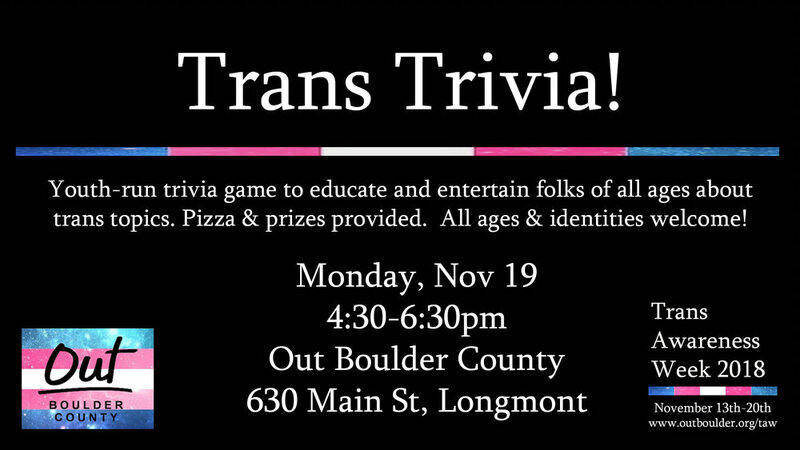 Youth-run trivia game to educate and entertain folks of all ages about trans topics. Pizza & prizes provided. All ages & identities welcome! 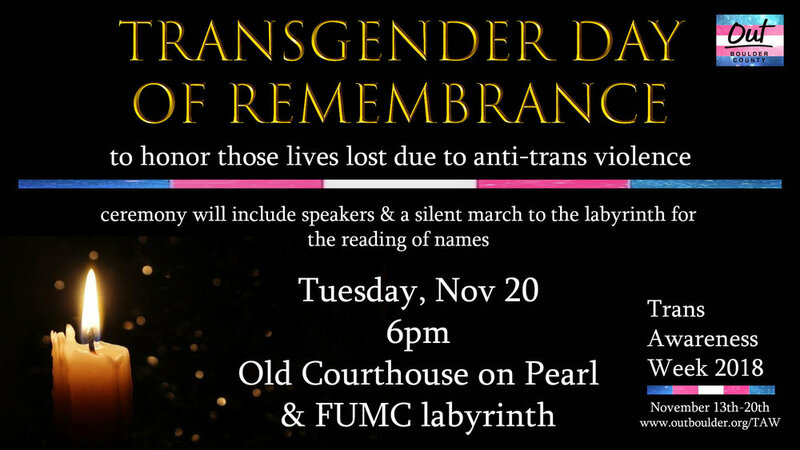 Transgender Day of Remembrance is an annual observance on November 20 that honors those lives lost due to anti-transgender violence. We will meet at the Courthouse on Pearl Street in Boulder to begin the ceremony and hear from speakers. Then we will walk silently together to the First United Methodist Church labyrinth for the reading of names. Attendees will have time to walk the labyrinth after the names are read. WANT TO GET INVOLVED WITH TRANSGENDER AWARENESS WEEK 2018? INTERESTED IN SPONSORING TRANSGENDER WEEK OF AWARENESS 2018? Questions, Comments, Concerns, or Want to Get Involved/Sponsor?